Knee pain and stiffness are classic signs of knee osteoarthritis. These symptoms tend to progress gradually, and many people initially attribute knee soreness or discomfort to lack of exercise or getting older. Many dismiss their early knee arthritis symptoms as "no big deal" until they worsen and start to interrupt one’s ability to enjoy everyday activities. Below is a list of common signs and symptoms of knee osteoarthritis. 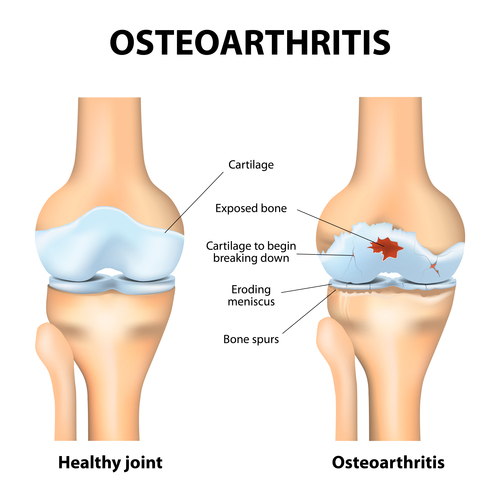 Early recognition of symptoms and appropriate treatment can dramatically slow or eliminate progression of osteoarthritis symptoms. Knee pain: Pain is the most commonly reported symptom of knee osteoarthritis. The description of the pain will depend on the patient’s condition and situation. For example, the pain may come and go or there may be a chronic low level of pain with intermittent flare-ups of more intense pain. The pain may be experienced as dull and aching or as sharp and intense, and it is usually worse with certain activities that place additional strain on the joint, such as when bending down or walking up stairs. Typically, the knee pain can be lessened with rest and an ice compress. Knee stiffness: Bone friction and swelling in the knee joint makes the knee stiff and less flexible. Knee range of motion can become more limited. A person with moderate to advanced knee osteoarthritis may find it is difficult to straighten out his or her knee. Some people may only experience stiffness in the knee in the morning or after sitting for a long period. Stiffness may or may not be accompanied by swelling. Inactivity makes it worse: Knees can become stiff after sleeping or sitting for a long period of time. People with knee osteoarthritis often find stiffness and pain are most noticeable when they try to get out of bed in the morning or out of a chair after a long period of sitting. Knee swelling: When knee cartilage wears away, the femur and tibia (and sometimes patella) bones can rub together, resulting in irritation and swelling of the knee (i.e. fluid in the knee). A swollen knee may be accompanied by a sensation of warmth, which can range from warm to burning. The knee may even be red and warm to the touch. Knee popping or crunching: Feeling a crunching or hearing a popping sound when bending the knee, such as when bending down into a squat, are signs that cartilage has worn away and is not protecting the bones from friction. The medical term for this symptom is crepitus. Knee buckling or locking up: Some patients with moderate to advanced knee osteoarthritis feel a sensation of their knees giving way or buckling, especially when stepping down stairs. This can occur if uneven grooves or flaps in the degenerated cartilage catch or if a piece of cartilage breaks off and becomes lodged in the joint, producing sensation of knee buckling or of the knee locking up. These episodes are unpredictable but tend to occur when strain is placed on the knee, such as when descending stairs or getting up from a sitting position. In most but not all cases, the symptoms of knee osteoarthritis come and go, becoming worse and more frequent over months or years. Knee osteoarthritis pain may flare up after high-intensity activities, such as jogging or tennis, or simple weight-bearing activities that add strain to the knee joint, such as squatting or stair climbing.